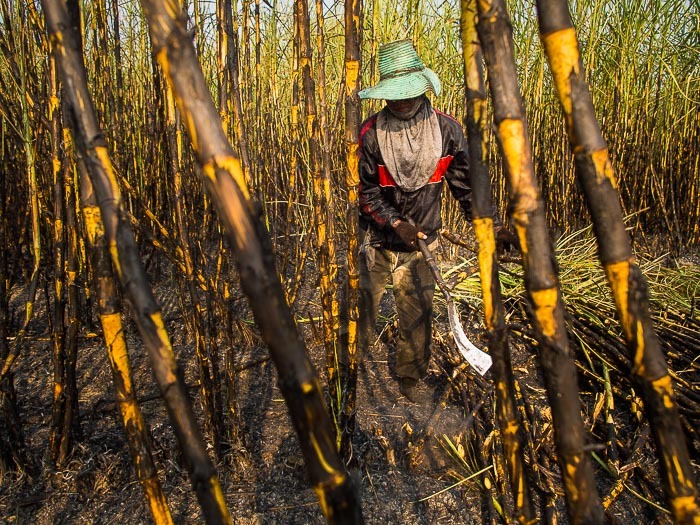 Workers cut sugarcane on a farm in Kanchanaburi province. 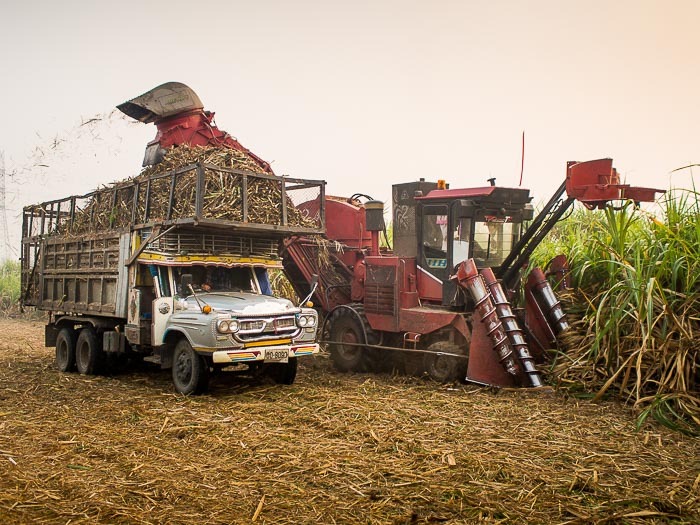 I went out to Kanchanaburi province west of Bangkok today to photograph the sugarcane harvest. Thailand is the world's 2nd leading sugar exporter. Brazil is number one and Australia is number three. Production in all three countries is dropping because all three countries, separated by thousands of kilometers on different continents in different hemispheres, are wrestling with drought. A mechanical harvester clear cuts a field in Kanchanaburi. The good news (or less bad news) for consumers is that prices are not expected to go up much thanks to a sugar glut from over production in the last couple of years. It's a little scary though that places as far from each other as Thailand, Australia and Brazil are battling the same climate enemy at the same time. I didn't go out to Kanchanaburi on a climate change story. I went out there to photograph the harvest because it's the harvest season and photos of workers in the fields might be good to have. I found out about the smaller harvest during interviews with farmers in the field then doing research for captions when I got back to Bangkok. 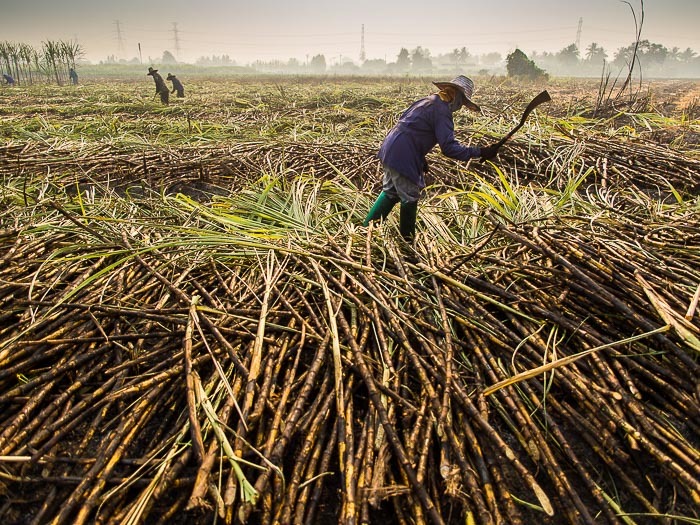 Most sugarcane in Thailand is harvested mechanically, but a few places still cut cane by hand. When cane is cut by hand a low fire is set to clear out the weeds and chaff. The workers then walk through the cane cutting the stalks at ground level. It's physically exhausting work and you end the day covered in ash. Many consumers in the US don't appreciate Thailand's role in our food chain. In addition to be a leading exporter of sugar, Thailand is also a leading producer and exporter of rice, shrimp and seafood, poultry and pork products. Drought here has the potential to seriously impact American and European consumers. Whether or not you like "Thai food" chances are you eat food from Thailand. 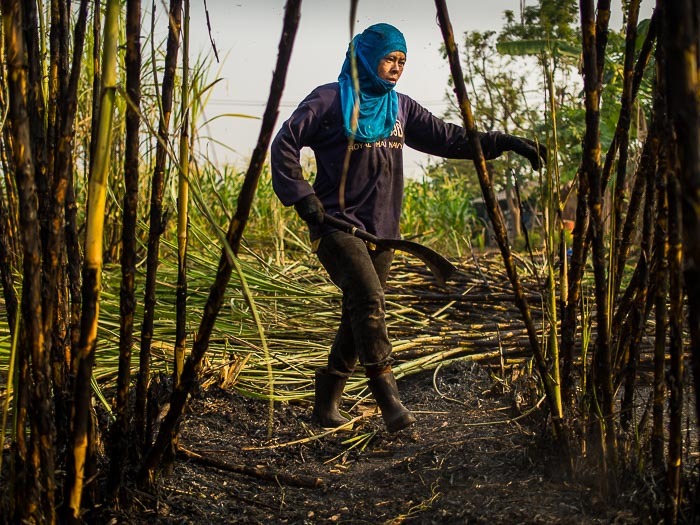 There are more photos of workers in the sugarcane fields in my archive or available from ZUMA Press.